Cardinals -- aka northern cardinals, redbirds, common cardinals or red cardinals -- are among the most instantly recognizable birds in North America. Males are covered in bright red plumage; females, although much duller, still have some red in their feathers. Attracting them to your feeder might require no more than a few small changes. Choosing the right type of food will help to attract Northern cardinals. These birds primarily eat seeds, so put out a variety. Sunflower seeds seem to be their seed of choice, so offer plenty of those. However, cardinals shouldn't live on one type of food alone, so also fill your feeder with safflower seeds and black oil sunflower, as well as peanuts, buckwheat and cracked corn. You can buy specialized wild cardinal seed mixes if you prefer. Having a reliable source of water is another draw for cardinals. A pond is a great year-round water source, but if you don't have or want one, a bird bath will do just as nicely. Ensure that it's always free from leaves and other debris. In the colder months, break and remove any ice that forms, or choose a heated bird bath. Having a place to drink and bathe will encourage cardinals to spend more time in your garden. Redbirds don't like to feed from moving targets, so choose a stationary feeder over a hanging one. They prefer to feed 5 to 6 feet off the ground, so a raised platform feeder is ideal. Cardinals will feed at ground level, so feel free to place some seed on the floor, as well. They like to eat in secluded areas, so it's best to place your feeder in an area surrounded by bushes. Although, you'll still want to be able to see the feeder. 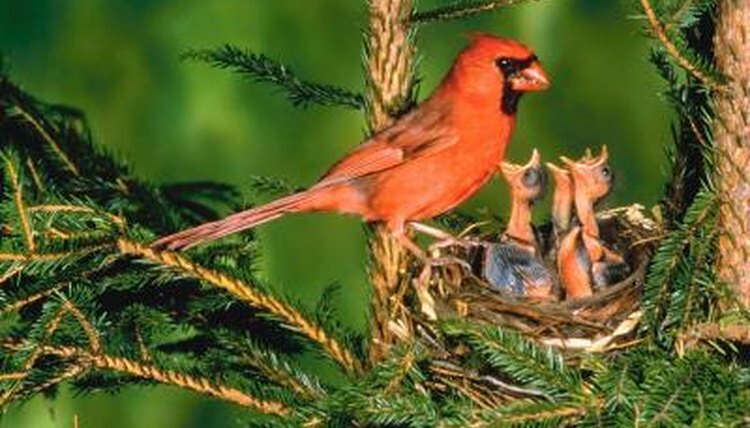 If you cultivate the correct surroundings, you could get some cardinals to nest and live in your garden, and you'll see them at your feeder regularly. Redbirds like to have a mixture of deciduous and evergreen trees surrounding their nesting area. However, they prefer to do their nesting in bushes, large shrubs or thick vines, particularly if they're fruit-bearing. They often pick nest sites that face open space such as meadows or lawns.